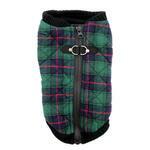 Your pup will look great and stay comfy with this Fashion Bomber Check Vest by Gooby in Green! This Fashion Bomber Check Vest in Green is a wardrobe essential this Fall and Winter Season. 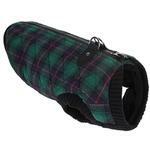 This fashion vest has a water resistant outer layer with a soft and warm fleece inside. 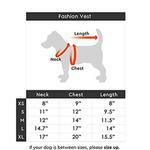 Stretch sweater underside addresses the issues of hard-to-fit wide-chest breeds to guarantee a perfect fit. Simply step in and zip up from the top of the vest. The flap underneath the zipper prevents hair from getting caught. The leash function is included for when it's walk time. 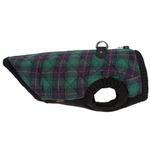 Ideal for smaller breeds. Please follow the size chart for a perfect fit. 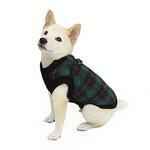 Fashion Bomber Check Dog Vest by Gooby - Green Customer Photos - Send us your photo! Pico and Paltrow actually like wearing these really warm coats! They are soft and I love the zipper on the top. It makes it so much easier to get on them than pulling over their heads! Beautiful coats! Posted On 04/06/18 by Korena S from King City, OR Yes, Korena S recommends this product! Was worried this might be too darkly colored for my pup but it’s beautiful on her. Another win for Gooby!! Posted On 01/08/17 by Leah C from Oceanside, CA Yes, Leah C recommends this product! I love Gooby brand jackets and have ordered 4 in the past couple years, but the latest vest arrived with a bent zipper pull. My dog really needed this vest when it arrived, so I kept it. Usually, these products are more than excellent and I continue to appreciate the attention to detail (fit, comfort, warmth, ease of use) they offer. However, I think this time the quality control person missed this issue before sending it to me. 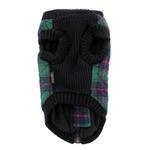 The fit is very good for my Bischon miniature poodle X dog (25 lbs. 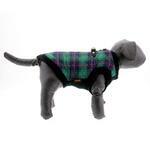 ), but it is a little snug around his waist, where he is a tad wider than a typical poodle. I think the XL size was otherwise correct for him. Posted On 10/12/16 by Jane D from El Cajon, CA Yes, Jane D recommends this product! Love it, love it. Perfect fit. I love Baxter Boo. They have excellent customer service and I love the personal touch of the thank you note in every purchase.